Category: How To | My site of all things random! So I recently found myself needing to move websites from one VPS to another. In this case it was the same provider but different datacenters within the US. While I was contemplating options I discovered a few rather simple tricks and thought I would share them here. My research didn’t turn up any complete post on migrations (though a few came close) and I wanted a somewhat comprehensive guide. As always this advice is given AS-IS and I cannot be held responsible if you destroy your data, bork your servers, or get your account suspended by your host. Anyway let’s get started. This post assumes you are moving between similar platforms and architectures. I’m going from CentOS 6 to CentOS 6 both are x64 platforms. If you are trying to migrate between dissimilar platforms (Debian to CentOS) or architectures (x86 to x64) there is a good chance these instructions will not work. I’m also assuming you have installed all the correct packages on your new server. You can do a “yum list installed” in your source server to see what all you have installed. This command needs run from the DESTINATION SERVER. If you are looking into the specifics of the rsync command please see here. The only thing I will note is the number after the -p is the SSH port number. 22 is the default. Assuming not much time has passed between the first time you ran this and now it should run fairly fast. Moment of truth, shut down all web service on the SOURCE server: MySQL, httpd, postfix, etc. Start all services on the DESTINATION server. Then change over your DNS to point to the new server. Assuming everything came up as expected you should be golden! Test all the sites you had running on the old server paying close attention to things like SSL and 301 redirects handled by the .htaccess files. You have now migrated to a new server! While this seems like a lot of steps when you actually dig down into it there really isn’t much here. Feel free to leave a comment with your experiences or any questions/comments you may have. Since I was unable to find a complete post on this I decided to write one. I found a lot of good information from other blogs and websites but nothing exactly what I wanted to do. I’m going to put together what I hope will be a complete guide for home temperature monitoring, power loss, and reporting/graphing (though that last piece will come in a later post). You are welcome to use any part of this or use it all. All code is open source under WTFPL. Basically what I wanted was the ability to monitor the temperature at multiple points in my house. I also wanted to monitor the power and alert on a power outage. Since the Arduino board is plugged into a UPS it will stay running for a while after the power goes out. Obviously without a UPS your Arduino would be unable to alert on a power outage. 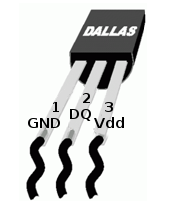 – As many DS18B20 temperature sensors as you want. I will use 4 for this project. – Wire – I am using spools of 2-pair telco wiring that I’ve had in my basement forever. 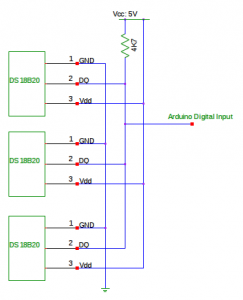 – Breadboard for connecting sensors and power to the Arduino board. – LAMP web server stack. If you want to run this on Windows I suggest XAMPP. Final notes before I get started with the actually how-to. I will do my best to give enough details on everything (without going overboard) for you to make this work. If you get stuck though please feel free to leave a comment or message me. I also give no guarantees on the code. If it works for you, wonderful. If it sets your computer on fire, I’m not responsible. Oh and if your system gets hacked from use of this code also not my responsibility. All code provided AS-IS. I am also going to attempt to link to all the places I found parts of this project but I greatly apologize if I don’t cite your source. There were a TON of different sources so there is a good chance I will miss someone. Alright – let’s get this show on the road! Wiring things up is quite straightforward. I will mention that I’m using an analog sensor on the breadboard just because I was able to get a free sample here. I would not recommend using these for your whole project as the voltage drop across the cable runs will cause problems. I just stuck one with the board because it was free so I figured why not. 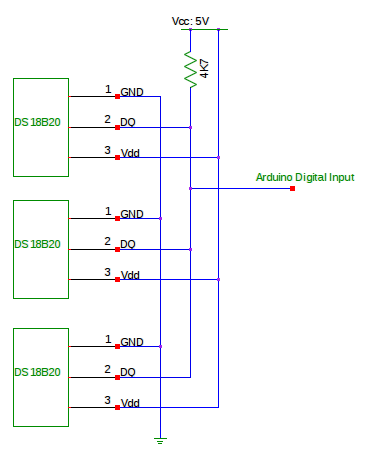 Alright connecting the DS18B20 sensors is really easy. We will be using normal mode (instead of parasitic) as this provides more consistency and allows for longer cable runs. Alright so things are wired up, now you need the addresses of the digital sensors. As I found this wonderful post on obtaining the addresses so I will not cover it in the post. 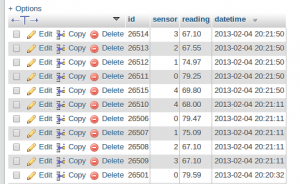 Please see that post for information on getting the addresses of the sensors. Here are the files you will need to get started: Zipped Files Obviously the .ino file needs to be uploaded to the Arduino board after inputting the correct server IP , host, mac, and sensor addresses. The .sql file needs imported into your database. The write.php needs edited with your DynamicDNS host if you are doing this from home. You can sign up for an account here. You just have to make sure one of the devices on your network is updating the IP address. Additionally if you are writing to a local web server you can remove this part as it’s merely for security to prevent anyone from writing to the database. After you have edited this file upload it and the lib directory to your web server. At this point you should be good to go. You can watch the output from the Arduino board on your PC to make sure that things are doing what they are supposed to. 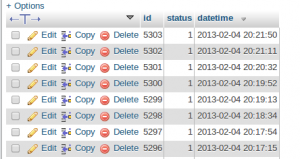 Also the logs on your webserver can be useful if you encounter problems. Hopefully this post helps someone and please feel free to leave a comment with additions/questions/problems! Thanks for reading! Alright, so I thought I would start posting some of my code here since this blog gets a fair bit of traffic. Anyway, I thought I would kick things off with a small script I wrote just last night and “perfected” this morning. I was a bit disappointed that Awstats doesn’t have a way to pull logs from a MySQL database. I have been logging my Apache access_log information to a MySQL database for quite some time now and last night it hit me that I could actually just export that data into a flat file for Awstats. The script, though quite simple in design, does that job and does it well. Simply set a few configuration options at the top and you are good to go. You can also have the script run the awstats.pl file to generate the stats after the data has been exported. 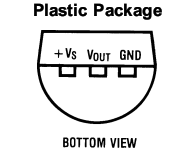 This is definable in the configuration section at the top of the script. Everything should be pretty straightforward really, just define the username/password/database/table at the top, set the location you are exporting to, and you are good to go. Just make sure the user you run it as has permissions to write to wherever you are exporting the log. It can be called from command line using “php /path/to/generate_awstats_log.php” or as a cron job similar to this “0 0 * * * root php /path/to/generate_awstats_log.php > /dev/null 2>&1” which would run every night at midnight. It’s also very quick, it can export tens of thousands of records in seconds, you will actually notice that it takes Awstats longer to generate your stats then it does for this script to create the file. If you have any questions or problems you can post them in the comments below or in the forums over at SourceForge. I’m not going to post the script here as I don’t want to keep it updated in two places but you can grab a copy over at SourceForge. Enjoy! !